The next Parish Council Meeting will be held on Monday 13th May 2019 in the Parish Rooms, Grundisburgh. GRUNDISBURGH is an attractive Suffolk village situated six miles from Ipswich and three from Woodbridge. 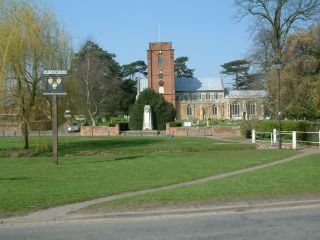 The village radiates from a central green surrounded by Church, Old School, Shops and The Dog Inn. The Green is criss-crossed by narrow paths and divided by a tributary of the River Lark which is spanned by two fords and two bridges. This is the heart of the village and gives it its unique character and appeal. A Primary School, Post Office, Doctor's Surgery, Chapel, Parish Rooms, Village Hall, and Playing Field are all within easy walking distance and beyond lies open countryside. St.Mary's Church has overlooked the Green since the late 13th Century. The view of the church across the green has long been a favourite subject with painters. Its brick tower houses a twelve bell peal. Inside a magnificent angel roof and wall paintings are the main features. The Baptist Church is one of the earliest examples of a dissenter's meeting house built in 1798. But however beautiful, this is not just a pretty picture post card village but a real lively community with a broad spread of population including lots of families with young children. There are 41 clubs and organisations, religious, sporting and cultural catering for both young and old. The Village Hall and Parish Rooms are constantly in use providing a home for many of them. The Playing Field Pavilion is very well equipped with bar, recreation and changing rooms providing a third venue for village events. The 7.5 acre Playing Field has two football pitches, three tennis courts and a children's play area. It is also the venue for the Village Show - a unique event in the best traditions of English village life bringing the whole village together in a day crammed with 'something for everybody'. Grundisburgh is very well served by its shops and pub. The Olde Forge Stores supplies a wide range of groceries. William's Store on the green is a veritable Aladdin's Cave selling an incredible range of goods. The Post Office also stocks a large selection of cards and gifts. The Dog Inn is a warm welcoming pub serving excellent food which attracts customers from miles around. With quick and easy access to Ipswich and Woodbridge, the Heritage Coast, and the trunk roads to London and the Midlands it is no wonder Grundisburgh is a very popular place to live and attracts many visitors. CULPHO is a small hamlet of 17 dwellings and an ancient church adjoining Grundisburgh. It is thought the name Culpho dates back to Saxon times when the village was the property of a landowner called Cupwulf or Cuthwulf. Its population has not varied much since the Domesday Survey was carried out. 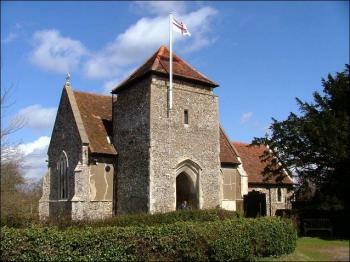 It is not certain when the church was built but it was in existence in 1086 and was mentioned in the Domesday Survey. The patron Saint of the church is St.Botolph who is the patron saint of travellers. It is thought he made a missionary journey to East Anglia as both the church in Culpho and in nearby Burgh bears his name. The church was surveyed in 2003 and parishioners were devastated to learn that essential repair and maintenance work was needed costing over £60,000. The 40 or so residents set about the task of fund raising and quickly raised all the money needed, an incredible achievement for such a small number of people.